I’ve went out with friend for a curry on Friday to a restaurant that none of us had been to before so I checked out the reviews online on revyu.com and several other revue sites via my iPhone. I found it had received mixed reviews and was a bit concerned about going on the basis of the feedback but decided to give it a go. I should have taken more notice of the feedback – The service was awful from the word go and even though the restaurant was only ever half full the staff couldn’t cope and it took 1.5 hours before we even got the starter. 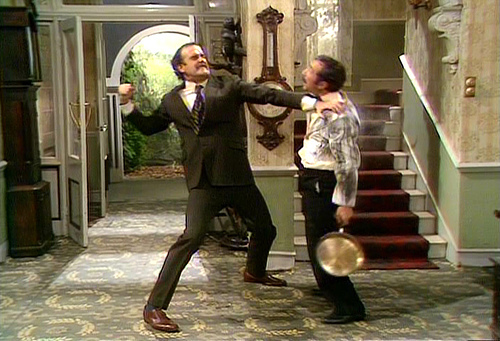 It was very much like an Eastern version of Fawlty Towers. Some of my friends complained but to no avail. Even at the end it took more than half an hour and three attempts to wave down staff before we got the bill. The philosophy seemed to be (if there was one) that letting the customer wait allowed time for people to drink more and therefore bring in more revenue through beverages. This has been proven to be a poor business model since quicker turnover on tables (according to those that run restaurants, such as Monsieur Ramsey) is the best way of securing greater income and keeps staff motivated since there is more opportunity for tips etc. By comparison this week I also took my bike to the bike shop to get it repaired since it has done 10,000 miles and needed a new sprocket. I had just recently bought a set of tyres from the same shop and noticed some lines down the side of the rear one so I asked them to check it at the same itme. They replaced the sprocket and checked the bike over and also replaced the tyre with one which would have cost £10 more than the one I bought originally and didn’t charge me any extra for it. This is the sort of service I value and it may only be £10 but it makes me feel good that they’re prepared to do that for me. I have bought three bikes from them in the past so they know that a small investment in my loyalty will secure future custom worth much more then the new tyre. Good Job CycleKing! The OU is looking at new models of providing courses. One of the most inspiring for me is the 2+2 model whereby students can apply to do two years of study at the OU remotely (part time) and then complete the final two years at another HE institution in the UK that is partnering with the OU on this scheme. This allows students to work at home (and save some money) in the first two years but then complete at a more traditional campus-based institution and receive a qualification through them. This could be particularly inviting to international students who wish to study here and continue on to work in the UK. It also allow other HEI’s to reduce the work in particular subject areas (and reduce costs) without having to remove the subject area from their curriculum. But how can such compleity in study and flexibility be managed to ensure quality and consistency? – enter (according to the CEO) the QAA and other bodies associated with ensuring quality and contributing to ensuring the awards are administered fairly. Without such a body, independently managing the quality assurance process the move to two year degrees, the 2+2 model or any other new form of degree awarding scheme would be much more problematic so in my opinion if these organisations can deliver good customer service then they have a vital role to play. I’m not into quango bashing for the sake of it – by all means reduce complexity but if you want flexibility and quality in our UK education services then we need have independent oversight of that and continue to invest in mechanisms to benchmark and ensure quality across the sector.